A week after facing a pass-happy Penn State, Northwestern will meet run-powered Wisconsin on Saturday. Badgers running back Melvin Gordon, one of the country’s best backs, carried 22 times for 172 yards against the Wildcats in last year’s matchup. There may not be two offenses in the Big Ten more different than Penn State and Wisconsin. The Nittany Lions are led by a surefire NFL prospect in quarterback Christian Hackenberg and have passed on nearly 56 percent of their plays so far this season. The No. 17 Badgers have a pro prospect of their own in the backfield, running back Melvin Gordon, and have run the ball on more than 68 percent of their snaps. A week after stifling Penn State’s passing attack in an upset win over the Nittany Lions, the Wildcats will play host to the Badgers’ ground game in their conference home opener, looking to continue turning around a season that looked dead in the water after an 0-2 start. It will be easily the toughest challenge for a run defense that has held up well over the first four games, limiting opponents to less than 3 yards per carry. But while none of NU’s first three FBS opponents is averaging even 5 yards per carry, Wisconsin’s average in that statistic is over 7. The Badgers are fourth in the nation in rushing yards per game, with 343.3. Wisconsin is, as coach Pat Fitzgerald puts it, “ginormous” along the offensive line, with the Badgers’ five starters averaging 6-foot-5 and 321 pounds. It will be a stiff test for an NU front seven that shone against the Nittany Lions. In last season’s matchup, it was the Badgers that won the battle in the run game, carrying 51 times for 286 yards in a 35-6 trouncing of the Cats. Fitzgerald said his defense will have to remain disciplined to improve on that performance this year. Wisconsin quarterback Tanner McEvoy will provide his own challenge. McEvoy, a former safety, is third on the team in rushing but has still run for more yards than any of NU’s running backs. Fitzgerald said he was pleased in general with the pass rush against Penn State, but McEvoy’s running ability will force the Cats to be sharper. But a well-run defense is not the responsibility of the front seven alone. The secondary must come up and make plays in the box when necessary. “Our safeties are going to have a lot of tackles on Saturday because they’re going to block everybody at the point of attack,” Fitzgerald said. Redshirt freshman safety Godwin Igwebuike, making his first start on Saturday in place of injured senior Ibraheim Campbell, will be key in stopping the run, and NU’s coaches will have to feel comfortable stacking the box and leaving the team’s cornerbacks on an island. 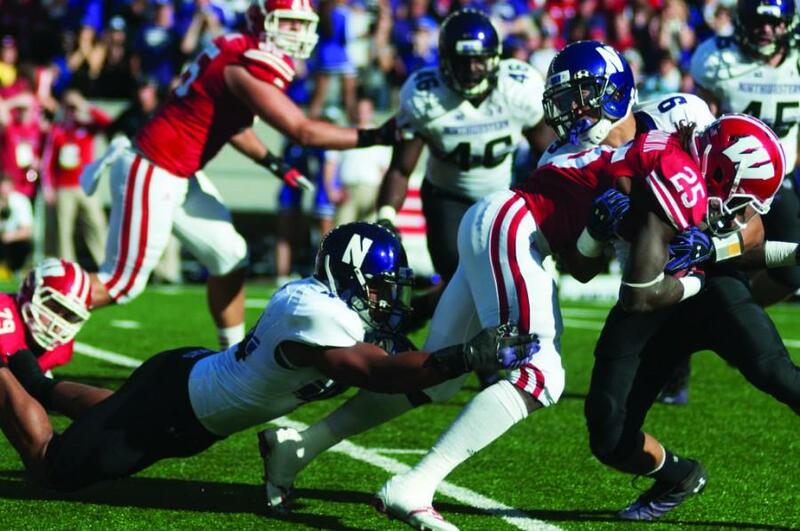 The latter area is where NU really shined against the Nittany Lions. While the pass rush was in Hackenberg’s face all day, that was as much due to Penn State’s struggles along the offensive line than anything NU did defensively. But sophomore cornerback Matthew Harris and junior cornerback Nick VanHoose, who were named the team’s defensive players of the week, were excellent against the Nittany Lions, holding Hackenberg to 216 passing yards, his second-lowest output of the season. That number could have been even lower if Campbell had not gotten injured on Penn State’s longest pass of the day, when he was in position to break up the throw. Senior linebacker Chi Chi Ariguzo said with the front seven occupied with Gordon and company, it will be up to the secondary to hold up. Ariguzo said despite the schematic differences, the defense is confident it can turn in a repeat performance. “We expect the same thing as last week, just everybody doing their job, flying around, making plays and having fun,” he said. Read more football coverage on our Gameday blog.